What Makes a Good Construction Management Partner? Making sure your construction project stays on schedule and on budget is of utmost importance. A construction manager (CM) works with you to execute the project, making sure the team is always in line with your vision from development to completion. While each project is different, good construction management partners all share certain characteristics. Most of all, effective construction managers are able to communicate clearly, effectively, and openly, both with clients and with the teams they are managing. This communication allows transparency regarding the budget, schedule, and progress of the project. Look for a construction manager who will interact with honesty and directly in your preferred manner, as frequently as you feel you need. Construction projects are not a one-person job. To complete a project on time and on budget, everyone must work together. An effective CM isn’t just an observer; they actively assist all team members, providing them with problem-solving insight, additional resources, or alternate options to be successful. A successful CM will help all members of the team view the project as a success. 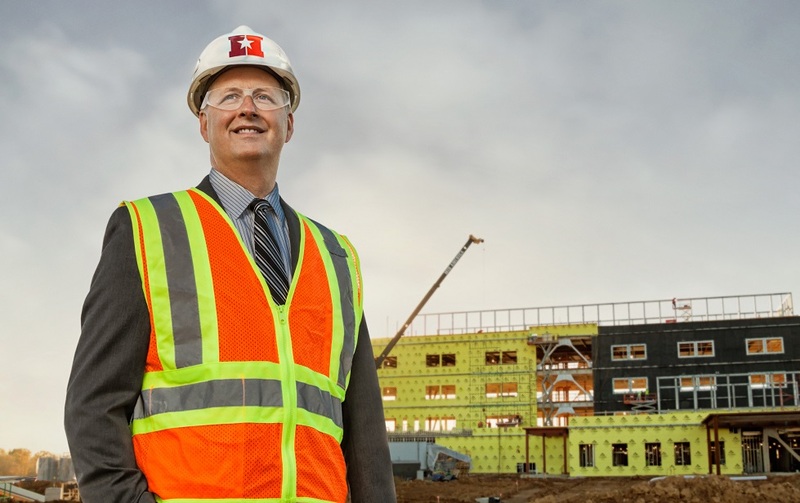 A skilled construction manager is a generalist who has the experience and skill to manage experts in all construction fields, from electrical to plumbing, and handle issues ranging from permitting to personnel. Look for a construction management team that has experience and knows how to be successful in your industry. This experience and knowledge enables your CM to lead and make decisions with confidence. During a construction project, various interconnected components are underway, creating the potential for a domino effect if one is delayed or altered in scope. An effective CM is able to make adjustments to reprioritize tasks as needed. Creative problem-solving in response to challenges is essential to keeping a project moving forward to meet schedules and budgets. An effective CM builds relationships with architects, engineers, subcontractors and local authorities. They work together with the teams to get their buy-in on project budgets and schedules. Quality and safety are important to all team members and the CM keeps that front of mind on a daily basis. These close relationships allow CMs to resolve project issues collaboratively rather than confrontationally. Most of all, you should be able to trust that your CM is your advocate, doing whatever is in their power to meet your goals. A positive, CAN DO! attitude is a trait of a CM who is dedicated to realizing your vision and is an invaluable asset to your project’s success. If you’re looking for a construction management company with these valuable qualities, contact Holland Construction Services today. We will go above and beyond for you! Holland is a different kind of construction company. Since 1986, we’ve been providing a full range of high-quality and personalized construction services throughout southern and central Illinois and the St. Louis region. Our foundation is built upon integrity, establishing relationships, and getting the job done right.